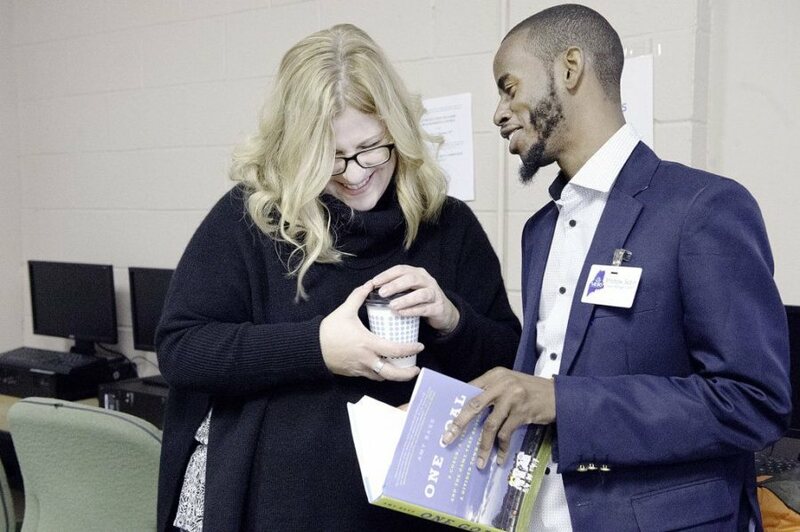 When professor and author Amy Bass ’92 returned to Lewiston this week, her first visit was to Maine Immigrant and Refugee Services. By mid-afternoon on Monday, the organization’s Bartlett Street offices, located across from the Italian Bakery on the periphery of the downtown Tree Streets neighborhood, was bustling. 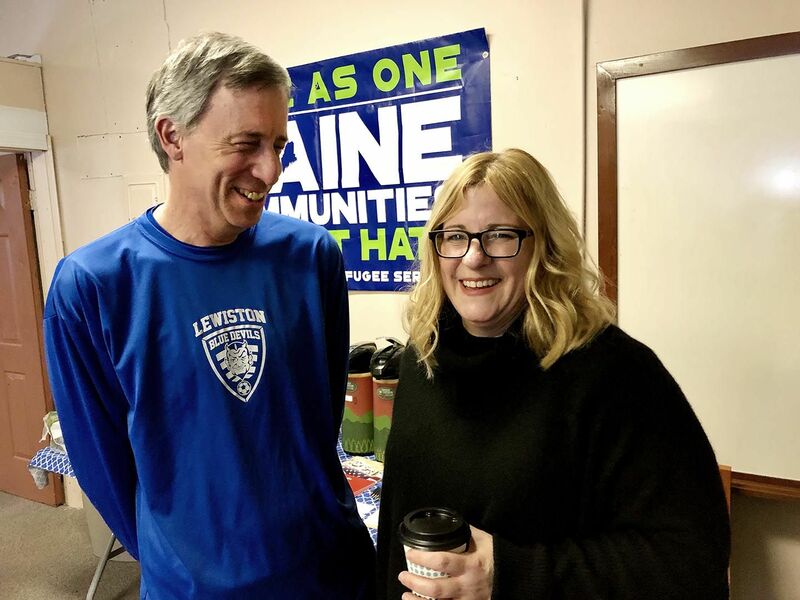 There were sandwiches, sambusa, and conversation, plus signed copies of Bass’ latest book, One Goal, which tells the story of the 2015 championship victory of Lewiston High School soccer team, many of whose members were Somali immigrants. The book features many of the people who warmly greeted Bass on Monday: Lewiston High School soccer coach Mike McGraw; former star player Shobow Saban; Abdikadir Negeye, a founder of what is now MIRS; a few of the players on that championship team. 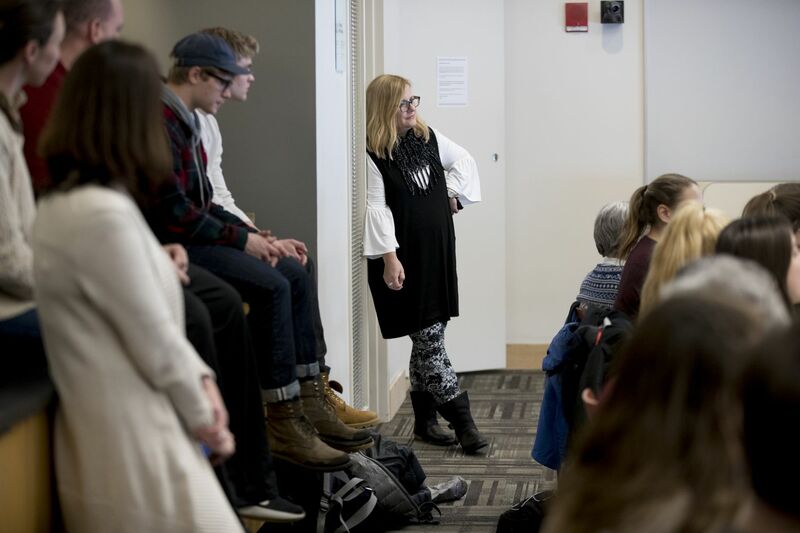 “It’s an American story, and it’s one that I hope teaches us what we can learn and who we should be,” Bass said to a Bates audience on Wednesday, another stop on the Lewiston leg of her book tour that’s attracting widespread media attention, including a visit to Lewiston by the NBC Today Show. One Goal: A Coach, a Team, and the Game that Brought a Divided Town Together is Bass’ fourth book. A history professor and director of the honors program at the College of New Rochelle in New York, she’s an expert on the intersection of race, sport, and society and a frequent contributor to Salon, Slate, and CNN, and she won an Emmy Award for her work as an NBC research supervisor during the 2012 Olympics. Those credentials — and the vivid writing and attention to detail they demonstrated — helped Bass convince the team and the community to give her the access she needed to tell the Blue Devils’ story. She had become interested in it in November 2015 — the Blue Devils’ championship victory was a striking juxtaposition to American politicians’ anti-immigrant rhetoric following the terrorist attacks in Paris that same month. “It still feels overwhelmingly relevant, the moment this book is coming out in,” Bass said in an interview. Bass spent months afterwards poring over newspaper articles, books, and yearbooks. She learned everything she could about Lewiston and the high school soccer team, before she interviewed McGraw. She then traveled to Lewiston several times in 2016 and 2017. She talked to McGraw and his coaching staff. She talked to the players, many of whom hail from several African countries. She talked to their parents. She talked to Kim Wettlaufer ’80, former director of Trinity Jubilee Center, a soup kitchen and community center that serves as a kind of hub for the Somali community, including support for youth soccer. She established trust and was invited into their homes, classrooms, and locker room. Bass’s ability to hang out was apparent to Shobow Saban, a central character in the book. Saban, who came to Lewiston from Somalia as a child, is a 2011 Lewiston grad who attended Assumption College. A well-known Lewiston figure, he now works at MIRS (he and his bride were on the cover of the Spring 2017 issue of Bates Magazine). And in telling the story, Bass learned more about her college town than she ever did in college. She also got a refresher course on Bates, which is no stranger to members of the Bass family: Amy’s mother, Ruth Haskins Bass ’55, is an alum, as is her sister Elissa ’85; a niece and nephew are current students. The result is an intricately detailed account of the Blue Devils’ road to the 2015 championship. One Goal traces Lewiston’s 18th-century Franco roots to the 21st-century influx of immigrants from Somalia and other African countries, which provided a much-needed economic boost but exposed racial tensions in the town. Somali middle and high school students, many of whom grew up in refugee camps and lived in several countries before coming to Maine, brought with them a love of soccer. They played constantly, and the skills they developed in pickup games at Simard-Payne Park, in Somali-led youth leagues, and on Abdullahi Abdi’s middle-school team, made them top picks for the high school team. By 2015, the Blue Devils roster comprised players from six different nations, primarily Somalia. McGraw, their coach, used the players’ strengths and styles — Maulid’s handspring flip throw-in, Abdi H’s preternatural ability to put the ball in the net, Austin’s goalkeeping — to build a top-ranked team. He also got involved in the community and accommodated Somali players’ family and religious obligations, all while insisting that white and Somali players support each other and play together. There was an undercurrent of hostility and even violence toward the Somali community in Lewiston; the Somali players faced discrimination and racial slurs from classmates and fans of opposing teams. But many in the community rallied around the Blue Devils, and the team, using the rallying cry “pamoja ndugu” — “together brothers” — won the championship game against Scarborough High School. Places in Lewiston — Simard-Payne Park, Trinity Jubilee Center, the Italian Bakery — are as present in the book as they were for its characters, and moments like the bus ride home from the Blue Devils’ heartbreaking 2014 championship loss to the 2015 pregame pasta dinner at Trinity are written as if Bass were there. 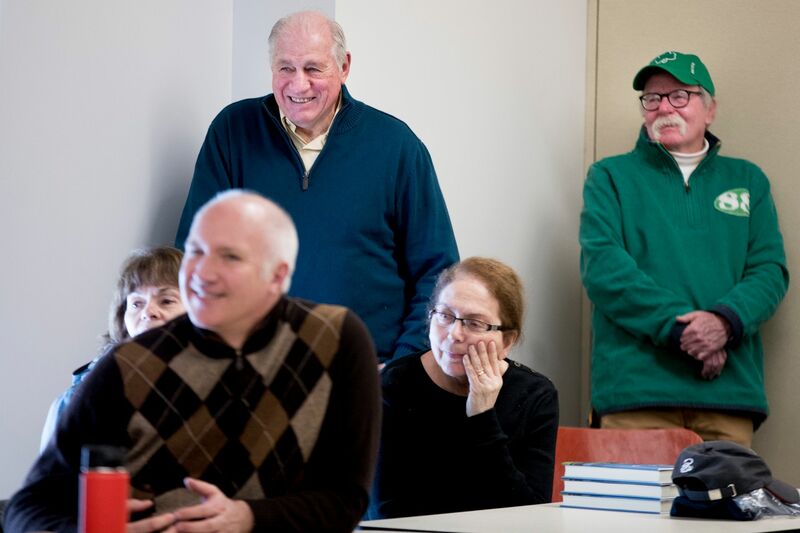 And they turned out to see the result: Coaches, players, students, and local residents packed rooms in MIRS, Bates, and the Lewiston Public Library to hear Bass read from the book. “It’s an enormous relief that they have the book, and we can talk about it, and we’re okay with it,” she said of its characters. The 2015 championship — and the subsequent 2017 championship that Bass wrote into One Goal at the last minute — didn’t solve racism and xenophobia in Lewiston, she acknowledges. 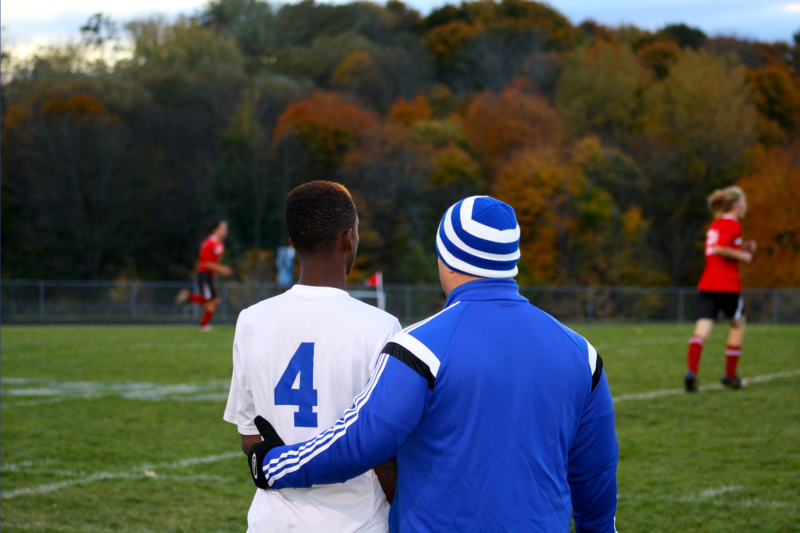 But the Somali presence on the high school soccer team became a point of pride for the Somali community and Lewiston as a whole; the 2015 championship game drew a crowd of 4,500. Bass sees the team as an example of multiculturalism at its best — of capitalizing on the strengths of each culture and each individual player to create a team greater than the sum of its parts, with implications beyond one game. It reminds her of the ancient Olympics, Bass says: the purpose of bringing the city-states together thousands of years ago was not to end war but to suspend it, to give the Greeks an idea of what life without war was like.